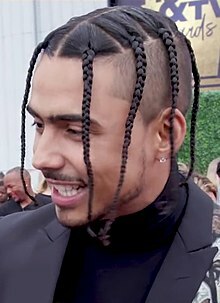 Quincy Taylor Brown (born June 4, 1991) is an American actor, entrepreneur, model and recording artist who performs under the mononym Quincy. He is best known for his debut starring role in the 2015 film Brotherly Love, and his music single "Friends First". More recently, he is a regular on the television musical drama Star. He is the son of the former model Kim Porter and singer, songwriter and record producer Al B. Sure!. Quincy Taylor Brown was born in New York City to late model Kimberly Porter and singer Albert Joseph Brown III (Al B. Sure!). He was named after his godfather, music and entertainment icon Quincy Jones. In 1994, when he was three, his mother began a relationship with Sean "Diddy" Combs and Diddy eventually adopted Quincy and raised him as his own. The couple had three more children together, a son, Christian, and twin daughters D'Lila and Jessie. For his 16th birthday, Diddy and Porter threw Quincy a celebrity studded party in Atlanta that was featured on MTV’s My Super Sweet 16. His family moved around often but he spent most of his youth in Georgia and later moved to Los Angeles, California in his final years of high school and completed his education at Calabasas High School. In August 2012, Quincy walked in the Gaborone Fashion Weekend event in Botswana. On February 19, 2015, he walked in Naomi Campbell's Ebola awareness show during New York Fashion Week. In June 2015, Quincy made his directorial debut with the music video for singer and actress Elle Winter's song No Words. He is the founder of the production company FourXample. He also has a watch line called Chalk by Quincy, a jeans collection with Embellish and a start-up technology company. 2015 CSI: Crime Scene Investigation Trey Peach Episode: "Hero to Zero"
2015 Keeping Up With The Kardashians Himself Episode: "Rites Of Passage"
2018 Wild 'N Out Himself Episode: "The Comb Brothers"
^ "It's baby times two for these couples - USATODAY.com". usatoday.com. ^ "WORK! Kim Porter is Spring Cover Girl for Runway Magazine". CocoaFab. ^ Ashley Williams. "Exclusive: Kim Porter Says Son Quincy Gets His Smooth Swag From Diddy & Al B. Sure!". HipHollywood. ^ "Diddy Enjoys $75 Million Yacht With Kim Porter In The Caribbean". Headlines411. 5 January 2015. ^ blackcelebritykids. "KIM PORTER AND DIDDY THROW "STUNNA 16" FOR QUINCY BROWN - Black Celebrity Kids". Black Celebrity Kids. ^ "Gaborone Fashion Weekend Recap Okayafrica". Okayafrica. ^ "Diddy's son to walk in Ebola awareness fashion show - Page Six". Page Six. ^ "Elle Winter "No Words" Music Video Directed By Quincy". mydiveo. Beverly Hills, California: Tiveo, LLC. June 30, 2015. Retrieved November 27, 2018. ^ "Have You Met Quincy?". THIRD FLOOR NETWORK. ^ Nicky G. "Sways Universe - Quincy is back with "Friends First" ft. French Montana". swaysuniverse.com. ^ "Ryan Seacrest - Quincy Combs Releases 'Stay Awhile' Featuring Kendre [VIDEO] -". Ryan Seacrest. ^ Chloe Melas. "[VIDEO] Quincy's 'Friends First' Ft. French Montana — Behind The Scenes - Hollywood Life". Hollywood Life. This page was last edited on 3 March 2019, at 15:50 (UTC).